Alex Stephenson (b. 1990, Philadelphia, Pennsylvania, USA) is a composer currently based in Southern California. His music stems from a deep-rooted lyrical impulse and a desire to engage in dialogue with other forms of artistic expression and aspects of human experience. 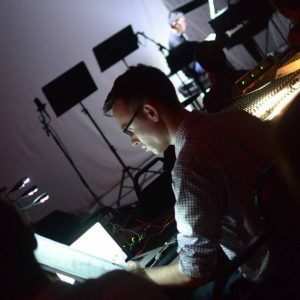 He has created work in a variety of acoustic, electroacoustic, and interdisciplinary contexts and seeks out forms that give rise to a sense of uncanny logic and urgent communication. His music has been presented at Tanglewood, Royaumont, Composers Conference, NYC Electroacoustic Music Festival, and New Music on the Point. Recent and upcoming performances include those by the New Fromm Players, FLUX Quartet, Ensemble Voix Nouvelles under Pierre-André Valade, Society for New Music, Ensemble Multilatérale, and many colleagues and collaborators at UC San Diego. He has been an artist-in-residence at Avaloch Farm Music Institute and Marble House Project. Alex’s principal teachers include Julian Anderson, Robert Morris, Oliver Schneller, and Rand Steiger. He holds degrees from the University of Chicago, Guildhall School of Music & Drama, and the Eastman School of Music, and is currently pursuing a doctorate at the University of California, San Diego.